For reasons that are not entirely clear to me, modern DSLRs are prone to back/front focus errors - which means the sharpest plane in the image is either behind or in front of the object you thought you had focused on. This is clearly something to be avoided as it will cause the most important part of the image to be softer than it should be. The amount of back/front focus error depends on the lens and camera and so different adjustments are needed for every lens used on a particular camera, including any teleconverters (or extenders). Fortunately, most DSLRs now allow this effect to be compensated for by using the camera setting parameter referred to as microAF. There are a few charts available on the web for measurement of these errors but I've never been fully confident in the results I obtained with them for various reasons including the significant variations that can occur from one image to the next (for more on this topic, so below). So I thought I would try creating something I was happier with, based on the usual approach of mounting the chart at 45° to the vertical. Here I show the chart I created and how I use it to make micro AF adjustments that I have a fair amount of confidence in, so at least soft images from that source should be a thing of the past! A word of warning though - much to my surprise and dismay, it seemed that the microAF value on my favourite telephoto lens - the Canon EF400f4 DO suddenly changed by up to 10 microAF units for no obvious reason sometime in the summer of 2015! So if you start getting softer than normal results, this is something you might want to check on. The MicroAF adjustment is specific to the lens and camera body. So different lenses and/or camera bodies can and do require very different MicroAF settings. Teleconverters/Extenders change the MicroAF settings for the lens and body, so you need to make the measurements below for every combination you use of lens, camera body and teleconverter. If you have 2 lenses and one converter that you use with both lenses, that is 2 x 2 = 4 settings that need to be determined! The MicroAF setting must be set in the camera before you take your photographs - this is NOT something that can be corrected for afterwards, even with raw images. Use the lowest aperture available on the lens when taking the shots of the calibration target opposite, to keep the depth of field as small as possible. This is likely to be f4 of f5.6 for telephoto lenses. The chart I created consisted of two columns of finely spaced horizontal black and white bars as shown on the right (click on the image to download the full resolution image). There is also a solid black bar halfway down the columns for focusing on. This image should be printed onto an A4 or similar sized piece of photo paper (or even ordinary paper) and mounted on a card. The card should then be mounted at 45° to the vertical at about the same height as the camera. Also the card should be square on to the direction you are viewing the chart from, so that the two columns are equidistant from the camera. However none of these things are critical and the purpose of the two columns is to allow for any slight twist in the chart relative to the camera viewing direction. I generally make these measurements outside on a bright day (if possible!) and use a tripod and cable release to avoid camera shake. The camera needs to be at a sufficient distance so that the chart roughly fills the field of view vertically. The active focus area should be centred on the horizontal solid bar, between the two vertical columns. The procedure is then to take a series of exposures using the chosen lens/camera combination for a range of different microAF settings (you need to change the MicroAF value for these shots in the camera). For each microAF setting I take 3 separate images, taking care to defocus and then re-focus the lens each time. If you have no idea what the microAF value is likely to be, I would suggest trying all values between -10 and +10. To save a little time, you could only use even values, i.e. -10, -8, -6 etc. It just depends how careful and thorough you want to be! The idea of taking this series of exposures is to find the best MicroAF value for the lens/camera combination that minimises the back/front focus error. Having taken the series of images with different MicroAF values, the task is then to find out which is the best MicroAF value for that camera/lens. Just looking at the images obtained may be sufficient to find the microAF value that gives the best definition of the fine black/white bars in the columns in the focus plane that runs along the horizontal black line. This is then the adjustment to use in the camera for that lens. However if this isn't conclusive, a more rigorous quantitative approach can be taken by looking at the grey level profiles down each of the columns (which should be very similar unless the chart is twisted). There are a various free programs available that will do this, including ImageJ, but my favourite for this sort of thing is the ISee! package that I also use for analysis of image noise levels. The demo version of this software from BAM in Berlin (intended for professional analysis of X-ray images) can be freely downloaded from http://www.dir.bam.de/ic/. Opening one the images in ISee! and then extracting a vertical profile (width 101 pixels) down one of columns of the image then shows a modulation function superimposed on the fine black/white bar pattern, as illustrated below. The maximum of this modulation function is the position of the sharpest focus in the image. In the example shown below this occurs at a position of about 680 pixels along the profile (marked by the blue cursor). For this microAF setting this is well off the required centre point which is marked by where the black bar interrupts the black/white pattern - which shows up clearly in the profile as the dip at c. 568 pixels - marked by the green cursorr. With Isee! the image is automatically annotated with the distance between these two cursors - 112 pixels in this case. Note that distances to the right of the dip due to the horizontal bar should be taken as positive, with those to left being negative. 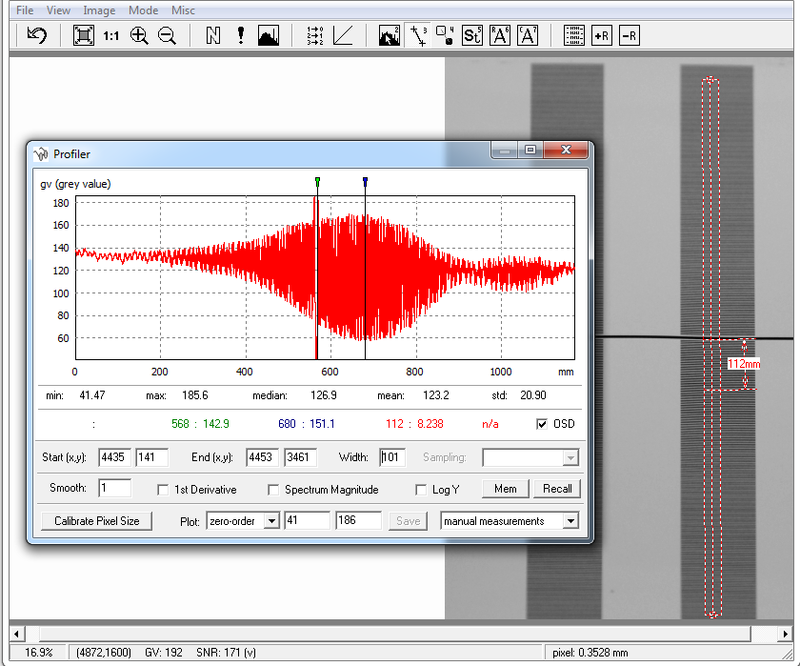 The required microAF setting is the one that gives a zero value of this "focus measure" or offset between the black bar and the peak of the modulation function (+112 in this example). One of the main issues with determining microAF settings accurately is the significant variation that occurs in the focus measurements. I dont know if this is only present on Canon DSLRs but it seems unlikely. This ties in with my experience of bird and other photos that show an annoying amount of variability - so much so that the best practice is to take numerous shots at a high frame rate and then look for the sharpest one in the sequence afterwards. Often there will only be one or two "good" ones with the majority showing disappointing sharpness. Clearly achieving focus on a moving target like a bird, often in mediocre light, and a confusing background can be difficult so some variation is understandable. But it seems surprising that a considerable amount of variation occurs in this ideal case - a fixed highly contrasting test chart pattern, viewed with the camera on a tripod operated using a cable release. I believe that the images obtained are not blurred due to camera shake or object movement - it is just that the plane of best focus is varying from shot to shot - which seems to represent a limitation of current DSLR AF systems (or those in my Canon DSLRs at least!). Having determined the focus measure values for all images collected (which can be a bit time consuming, especially if the left and right columns are both measured and the values averaged), the easiest way of making sense of the results is to plot them using a spreadsheet such as MS Excel. I setup a Sheet and associated Chart which allows me to plot all the individual values obtained for the focus measures from the 3 repeat images taken at each MicoAF setting (if you collect 3 shots per setting, and go from -10 to +10 microAF in steps of 1, there will be 63 values!). The spreadsheet also calculates the average value of the focus measure for each microAF. The plot below shows the values I measured from images taken with my Canon 7DMkII and the EG 400f4 DO lens with a Mk III x1.4 TC, on a dull evening. The blue symbols shows the individual focus measure values for each image (average of the left and right columns) while the red squares show the average for each microAF setting. The first thing to notice is the considerable scatter in the values - which is why determining the best "average" value to use with the lens/camera combination is less than straightforward. The solid black line is the Trendline fitted to the values using a standard Excel feature. The equation of the Trendline is also shown. 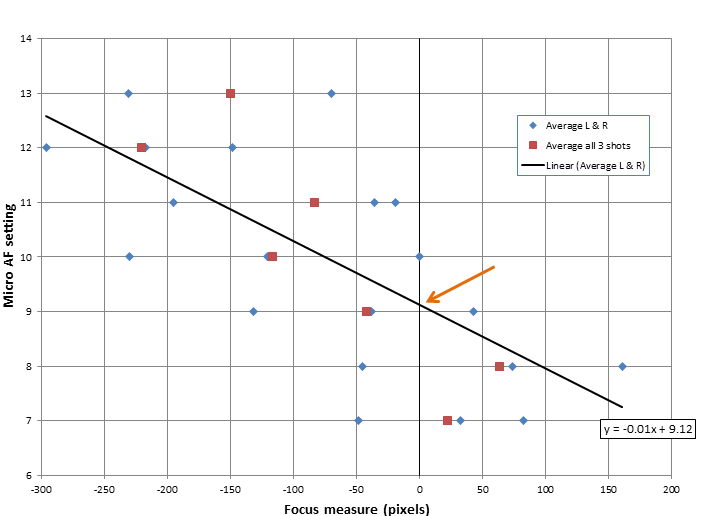 The best estimate of the microAF value that minimises back/front focus errors is given by the intercept between the Trendline and the vertical axis (where the focus measure is zero). In the example below this is +9.1, or +9 rounded to the nearest integer. Using this form of analysis it is possible to quantify the scatter in the focussing, which I attribute mainly to limitations in the camera's AF system. In this example, the standard deviation of the measured values is as high as 1.5 microAF units, and the largest single difference from the Trendline is -3 microAF units. My experience with other series of measurements taken with different lens/camera combinations is that this is a higher than normal level of scatter - probably caused by the dull conditions used for the photos and the use of the x1.4TC (which does tend to increase the scatter). In brighter conditions, without a x1.4TC, the standard deviation is more usually about 1 microAF units. Once you've decided on the best value, remember to go back to the camera to set this value for the lens (and converter if used) - don't forget and leave the camera setting on the last Micro AF value you used when taking the series of calibration shots (e.g. +10)! Excel Chart showing analysis of the focus measure values derived from different MicroAF values. The optimum MicroAF setting is the one which gives a zero focus measure (shown by the arrow). In this example, the value to set the camera to is +9. To illustrate the range of values you may find, the table below shows values I have found for my latest camera body - Canon EOS 7D Mk II. Note that many of these values are well away from zero, indicating the need for making these measurements and adjustments. Without these corrections, the images from all my lenses, apart from the 400mm f5.6 (without the x1.4 teleconveter) would be noticeably soft due to this effect! This may seem an elaborate method for determining microAF settings but with a bit of practice it doesn't take too long for each lens - and can be viewed as a small investment in time, compared with that spent in the field trying to get sharp photos! Having tried this method on several lenses, I have confidence in it, and the results it produces. I have tried a repeat series of measurements on the same camera/lens and the results were comfortingly similar! This method also highlights the limits of current DLSR AF systems and quantifies the variability that can occur even in ideal cases. Any feedback or requests for clarification are welcome - see my contact details on my home page.